Composed by artist Chris Duncan, 12 SYMBOLS is an immersive sound performance that metaphorically implicates the energy and patterns of the sun, moon, and the phenomenon of the eclipse to ponder our relationship to the passing of time. 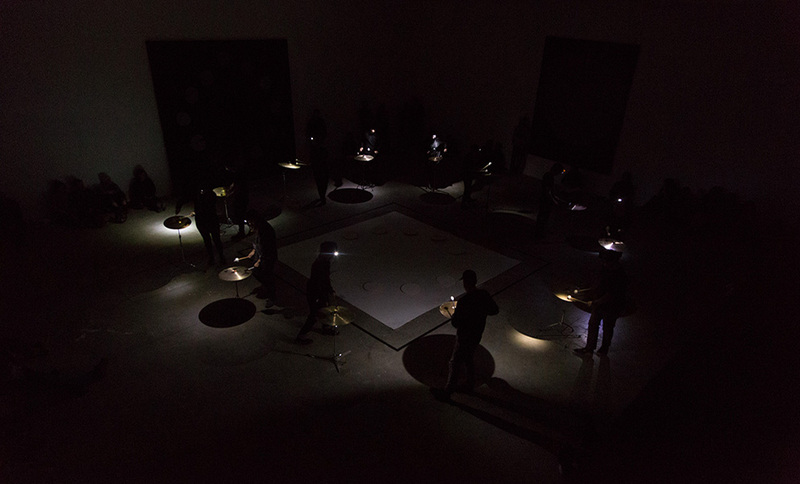 Cymbals become symbols as 12 percussionists, standing in a circle as if they were numbers on a clock, engage light, movement, and time through a series of repetitive sonic gestures. Audience members are invited to sit inside or outside the circle for this hour long performance. Please bring a floor mat or cushion. Performers include Matthew Bajda, Kevin Corcoran, Patrick Crawford, Chris Duncan, Nava Dunkelman, Warren Huegel, Anya Kamenskaya, Chad Mooney, Nkiruka Oparah, Dennis Remsing , Nicole Thomas, and Christie Yuri Noh. Chris Duncan was born New Jersey and currently lives and works in Oakland, CA. Outside of his active studio practice he organizes events and co-runs the small artist book press and record label LAND AND SEA. Duncan earned his BFA from the California College of Arts and Crafts and his MFA in Art Practice from Stanford University. He exhibits internationally, and is represented by Halsey Mckay Gallery, East Hampton, NY. This program is presented in conjunction with 10,000 Fahrenheit, a group exhibition centered on the sun and exploring the intangible on view at the SFAC Main Gallery through December 8, 2018.